* The advertised Lease is a rental-purchase agreement for new merchandise. Unless you exercise your Early Purchase Option, to acquire the merchandise you must make 52 weekly payments of $3.00 (plus tax & delivery), for a $156.00 (plus tax & delivery) Total Cost/Total of Payments. This includes a $95.99 Cash Price3 and a $60.01 Cost of Rental. 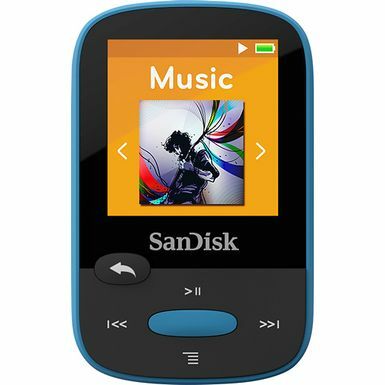 Clip, listen, and hit the gym with the blue SanDisk 8GB Clip Sport MP3 Player. This lightweight MP3 player features 8GB of flash memory and a microSDHC card slot that supports memory expansion. The player has a convenient clip that's designed to keep the device secure - even if you're working out. Just clip it to your clothing or wristband, and hit the gym or head out for a jog. The Clip Sport is also equipped with a 1.44" color LCD screen that makes it easy to navigate the intuitive user interface. You can quickly choose songs sorted by title, artist, or album. Unlike smartphones or other portable music devices, the SanDisk Clip Sport MP3 player has a clip that lets you attach it to your shirt, hat, or wristband while you're working out. It's also so lightweight that you may hardly realize it's even there. The SanDisk Clip Sport MP3 player contains a 1.44-inch color LCD screen (128 x 128 pixels) that allows you to operate the device easily and intuitively, even when you're on the treadmill in the middle of a workout. Along with a digital audio player, the SanDisk Clip Sport MP3 player features a built-in FM tuner that lets you listen to your favorite radio stations while you're exercising. The tuner can also interface with your health club's wall-mounted television.